Foot problems, and resulting foot pain, is a common occurrence. Approximately 75% of Americans suffer with chronic foot pain. The discomfort could be rooted in problems that have become actual medical conditions, like bunions, Plantar Fasciitis, or hammer toes. Many of these conditions can be brought on through the wearing of poorly fitting shoes. There are alternative footwear choices available that prevent foot pain and misery. Birkenstock, Finn Comfort, and Dansko shoes are designed with an understanding of the anatomy of the foot, the specific areas that need support, stability, and freedom, and the risks of ignoring these needs. The foot has 26 bones with 33 joints and well over 120 muscles, nerves, and ligaments, including eight major muscles. It is a relatively small appendage that is responsible for carrying the entire body around all day. It is no wonder that so many develop problems with their feet. A bunion is an abnormality in which the big toe points towards the other toes, usually accompanied by pain and swelling. Ill fitting footwear can cause bunions. Solutions include pads, medicine for the pain, and orthotics (specialized shoe inserts), and proper footwear. Treatment for more extreme cases involves surgery to realign the bones. Excess bone may be removed and sometimes changes are made in the surrounding tissue. Recovery can take up to three months, but it may take as many as six months before the patient can return to wearing regular shoes. Plantar Fasciitis is a painful condition that can also be rooted in ill fitting shoes. The plantar fascia is a stretch of tissue that runs along the bottom of the foot, connecting the heel to the toes. One of its functions is to absorb the shock to the foot when walking. If an individual wears shoes with very thin soles, this tissue has to deal the impact. Women are more prone to this condition because of their predilection for high heels. High heels can actually shorten the Achilles tendon, which in turn, can put additional stress and tension on the plantar fascia. Treatments for this condition include a boot or splint to wear while sleeping to stretch the tissue, physical therapy, or orthotics. Only under dire circumstances will surgery to detach the plantar fascia be performed. Hammer toes are often seen in individuals who wear very high heels or shoes with pointed toes that crowd the feet. Shoes like that cause an unnatural flexing of the toes that can become permanent as the tendons contract and make the toe curl unnaturally, so they are bent and look something like a hammer. This usually occurs in the toes right next to the big toe and can cause difficulties. Movement of the stiff toe(s) can cause pain and the raised joint(s) can rub against the inside of shoes. Recommended remedies involve finding shoes with plenty of room for the toes, and doing exercises that strengthen the toe muscles. Only in severe cases is surgery to relieve the tendon and remove jutting bone an option. Metatarsalgia can be brought about by hammer toes, bunions, or by wearing very high heeled shoes. It is a painful inflammation of a nerve between the foot bones. It can be treated by icing, orthotics, or with a pressure bandage. Only in extreme circumstances is surgery to realign the bones considered. With the dictates of fashion and the increased shopping options brought about by the internet, it is no wonder that people are not making the most prudent choices for their footwear. There are, however, choices available that can relieve foot discomfort, but even more importantly, prevent foot problems from developing. 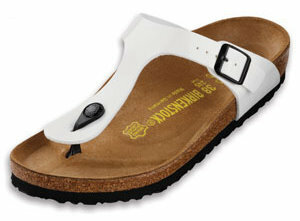 Birkenstocks are known for creating the first contoured insole for custom shoes in the late 1800s. In the 1960s these inserts actually became Birkenstock sandals. That they have remained popular since then is no surprise. They are constructed of top quality materials, with cork and latex footbeds that distribute the weight. They provide arch support, stability for the heel with a deep cup, and a toe bar in the front of the sole to stimulate circulation. These orthopedically correct shoes also have ample space for toes to prevent crowding. Finn Comfort shoes have been providing handmade shoes that provide support, as well as comfort, since 1945. They are a custom fitted shoe, and only a well-trained salesperson can ensure a good fit by carefully measuring the feet. Based on current medical research, the shoes are designed to e mulate a natural rolling walk. With a natural cork footbed, many feel that the Finn Comfort walking shoe is without peer. Dansko shoes began when a husband and wife traveled to Europe and discovered some amazing barn shoes. They began bringing them back to the United States to share and sell, and realized they had something worthwhile to offer. Now a popular shoe, Dansko offers plenty of support for the arch and the rest of the foot, as well as padding to absorb every day wear and tear. 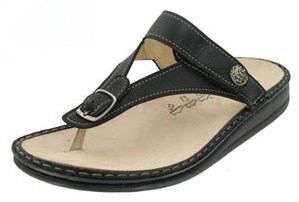 Features vary with style, but the popular clog features a bottom that rocks when walking to encourage natural movement. A person who is experiencing foot problems deals with misery every day. Furthermore, painful foot conditions can cause an unnatural walk that can lead to other issues, like knee, hip, or even back problems. Finding a shoe to keep feet healthy through everyday activities is essential.